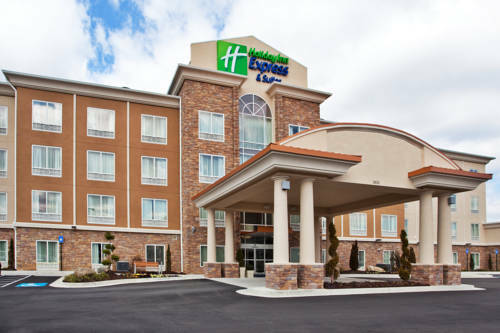 Welcome to Our Atlanta Airport Hotel's PropertyAdjacent to Camp Creek Marketplace and only 15 minutes from downtown Atlanta, the Holiday Inn Express & Suites Atlanta Airport West - Camp Creek hotel is the perfect place for business and leisure travelers. In addition to a boutique style, we offer services like a free, 24-hour airport shuttle and an airline flight display screen in our hotel's facility.In Atlanta, GA, corporations such as Chick-Fil-A and Delta are just minutes from our location, and if you need to hold meetings with business clients, we have two event rooms that accommodate up to 100 guests. While you look for hotels near Atlanta airport, keep in mind that we're just 4 miles from Hartsfield-Jackson International Airport (ATL) and only 3 miles from Georgia International Conference Center.Coming to the area on vacation? Exciting downtown attractions like the World of Coca-Cola and Georgia Aquarium are just minutes from the hotel's property in Atlanta. We're also a short drive from Six Flags Over Georgia and within walking distance of Camp Creek Marketplace with more than 100 stores and restaurants.After a day of traveling, relax by an outdoor, lakeside patio or take a dip in the heated, indoor pool. We also offer the free, hot Express Start Breakfast Bar and free Wi-Fi access to keep you energized and connected. You'll enjoy all these amenities and more when you stay at our hotel's location near the Atlanta airport. Spacious Boardroom that can accommodate up to 15 guest conference style. This room is also flexible for other seating style to accommodate up to 35ppl. The room is equipped with a 42inch tv and speaker phone. Bright and airy for a comfortable meetings. Planning a meeting or function in Atlanta? We can deliver a unique lake setting and a talented staff to provide you with maximum results for your next business or social function. This room is able to accommodate a variety of meeting styles and sizes.